Commander Star-Esseenia is the daughter of Commander Ashtar of the Ashtar Command, now known as the Solar Star Command. Commander Star-Esseenia is the Quadrant Commander for the Star-Esseenia Division which is the Healing Division for the entire Ashtar Command. Commander Star-Esseenia and the Star-Esseenia Division creates and manages the Star Team Programs that Rev. Alexandriah channels to FREE her clients and by extension all of Humanity from the MATRIX by 2045. All Karma Clearing - MATRIX Clearing Technology Rev. Alexandriah Stahr offers her clients come from the Star-Esseenia Division of the Ashtar Command. 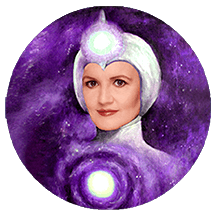 As the main research scientist within the Star-Esseenia Division, Commander Star-Esseenia both creates and manages all of the Star-Esseenia Division's Healing Modalities and Spiritual Development Technologies. Rev. Alexandriah Stahr has access to all of these Star-Esseenia Division Healing Energies and Technologies which she then offers to her clients for healing and spiritual development. The Chemtrail Protection Star Team is just one of many Star Team Programs that Alexandriah offers to her clients. The Chemtrail Protection Star Team is a standalone program that can benefit those who want the specific benefits of being protected from Chemtrail Poisons and Toxins without being required to be part of her other spiritual development programs.